Animate Pro allows you to set a minimum and maximum angle constraint on certain joints such as the knees or elbows. 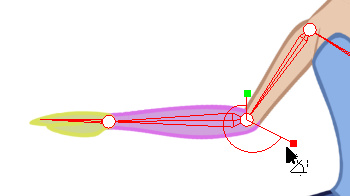 When using the Inverse Kinematics tool or even the Forward Kinematics (Transform Tool), it is possible that some joints will bend in the wrong direction. It is recommended to use the minimum and maximum angles only if the character does not change view. For example, if a character is facing the camera and has some angle limitations enabled, it could be problematic if the character switches to side or quarter view since the joints won't bend the same way. You can use the minimum and maximum angle constraints if your character's views are in different templates or layers. If the character's views are in the same layers, you are better off not using the angle constraints. If you plan to animate a lot with the Inverse Kinematics tool, it is a good idea to try the angle constraints. It depends on your taste. The angle constraints can be set by the character builder or by the animator in some particular scenes where it is needed. 2. In the Tool Properties view, in the Mode section, make sure the Edit Min/Max Angle Mode is enabled. 3. In the Camera view, [Ctrl] + click (Windows) or [⌘] + click (Mac OS X) on the piece to set the minimum and maximum angle for. 4. In the Tool Properties view, in the Selection section, click on the Enable Min/Max Angle option. 5. In the Camera view, rotate the Minimum and Maximum handles to set the angle. 6. Test your angles using the IK Manipulation Mode . 7. For additional control over your Min/Max Angle go to Edit > Preferences > Camera > Inverse Kinematics (Windows) or Animate Pro > Preferences > Camera > Inverse Kinematics (Mac OS X) and take a look at the Min/Max Angle Constraint Wight. Although the maximum value goes up to 1.0, in a production setting, the most practical value would be closer to 0.1. This value acts similar to the Stiffness setting in the Tool Properties view. The greater the value, the more difficult it becomes to approach the minimum and maximum values.